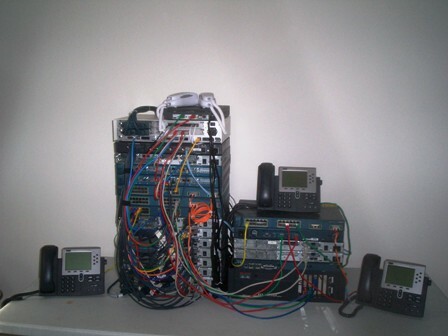 When studying for any Cisco certification there is no substitute for hands on experience. The best way to gain this experience is to practice on real Cisco hardware. There are a number of routing and switching simulators available but they are still no substitute for the real thing. Today you can build a Cisco practice lab that will provide all the functionality needed to pass the CCNA and CCNP at an affordable price. But before we get into specific models let’s take a look at couple of special functions needed in our lab that routers can provide. One very important function in most lab scenarios is Frame-Relay simulation. This can be accomplished by ether a Frame-Relay switch like the Adtran Atlas 550 or 800 series integrated access device or with a Cisco router with multiple serial ports configured to simulate a Frame-Relay switch. Each of these devices has advantages and disadvantage. The advantage of the Adtran Atlas 550 and 800 is that the switch can provide other switching functions such as ISDN, PSTN, POTS and T1 these functions are not available on Cisco routers. The disadvantage of this device is the limited number of serial ports and the cost. The advantage of the Cisco router is the number of serial ports. Depending on the Cisco router model selected the Cisco router can support a large number of serial ports. For CCNA scenarios a router with four serial ports will be sufficient. The disadvantage is that the router is dedicated to the function of Frame-Relay switch. If a Cisco router is selected for this function the RAM and Flash requirement are minimal and it is not necessary for the router to have anything more than IP basic IOS installed. Another very useful function is a Terminal Server. This device is acts like a serial switch and provides access to the console ports on all the other routers in the lab without having to move the serial cable from router to router. This is accomplished by using a router with multiple asynchronous ports. Each of the asynchronous ports is connected to the console port of each of the other routers. A terminal is then connected to the console port on the Terminal Server. This router also requires minimal memory and basic IP IOS. The remainder of the routers needed is of various I/O port configurations with so that we can practices different topologies. These routers should have an enterprise version of the IOS installed and sufficient memory to support that IOS. When looking for routers for your lab keep in mind that it is not necessary to purchase the latest Cisco models. If you compare the functionality of the IOS options you will find that the older 2500 series router will work just as well as the newer models for our prepossess. The 2500 series routers have fixed I/O and require a Ethernet transceiver while the 2600 and 3600 series router have the ability to be configured with a number of different I/O modules. In my next article I will be discussing a basic lab configurations and its components that will allow us to build and practices various CCNA and CCNP scenarios without having to reconfigure the physical lab configuration.